Why Hasn't Everything Already Disappeared? is the eight studio album by Deerhunter, released by 4AD on January 18, 2019. Should make for a great live sound. A powerful set of often-dystopian songs revolving around the decline of civilization. The album infuses bleak tumbleweed landscapes into the experimental — and often surrealist — soundscapes, revolutionizing the band’s approach to recording. Fifteen years in, Deerhunter have created something meaningful and masterful. Whilst Deerhunter haven’t disappeared, this album sees the band struggled to separate themselves apart from what has come before. In the context of Deerhunter’s catalogue it takes 15 years of oscillating and condenses everything that makes this band great into about 40 minutes. While the intention may have been to align closer with the now electronic- and hip-hop-focused music market, the album fails to feel relevant. Why Hasn't Everything Already Disappeared? may not reach the heights of Microcastle or Halcyon Digest, but it brims with issues of mortality that feel gloomier than ever, making the album a far richer experience through multiple listens. We should be grateful that everything hasn’t disappeared yet, otherwise we wouldn’t have heard this great new album. It’s an album that neither feels settled – surely intentionally as there’s no lack of musical confidence here – and never allows you to settle, often clouding the imagination of its creators behind a hazy sound. Underneath it all, Deerhunter are still a band that are completely beholden to music's ability to spiritually transcend even the worst state of things. They remain an intriguing and unique band but it has to be said that this latest album is a very patchy affair and yet again fails to live up to past glories despite a myriad of good moments. Ultimately Deerhunter’s performance art is spellbinding. Treasure the tiny little miracle that some benevolence allows us to hear a record like this and know we’re not alone—even if we appear to be. Like ghosts that don’t know they’re dead, the songs on Deerhunter’s Why Hasn’t Everything Already Disappeared? wander about in a well-produced limbo almost in mourning for the death they can’t die. It lingers like the beauty of dusk, when light slowly gives way to darkness. Using bucketloads of echo and distorting Bradford Cox’s vocals isn’t enough to create interest. It’s true to the spirit of collaboration, all dense with interesting textures and ideas. 'Why Hasn't Everything Already Disappeared?' is still as exciting to listen to as any of their early work, and helps maintain that high level of constancy the band have always been able to conjure. Cox himself has said that the band’s golden age is over, yet this album, like the band’s previous two, only gets better with repeated listening, and if this is the sound of a band in supposed decline, they can still smoke nearly any other outfit working at their peak. It’s a predictably great album that might push its way into the album of the year lists. Inspired, or spooked, by notions of cultural and personal erasure, the songs have an entrancing melodious charm but also sharper, more confrontational passages, such as the stop-start dislocations in tempo applied to “Nocturne”. It makes for a complex, challenging and thoroughly compelling album that, in spite of some of its weaker tracks, is one of the first essential pieces of listening in 2019. Why hasn’t everything already disappeared? I wish Deerhunter could help us answer these questions. Deerhunter managed to turn in one of their stiffest, clunkiest project to date - which is saying something considering how much of the inorganic percussion they had on Fading Frontier! 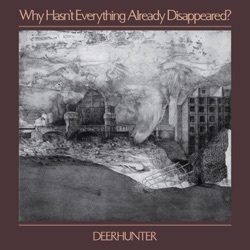 A self-proclaimed sci-fi album about the present, “Why Hasn’t Everything Already Disappeared?” proves again Deerhunter can rise to the challenge of reinventing their sound without losing themselves — without disappearing. A singular thing, not quite of this world, desert fruit ripening quietly on the eve of the end. From the weariness and wonder in its title to the mix of delicacy and anger in its songs, Why Hasn't Everything Already Disappeared? is one of Deerhunter's most haunting and thought-provoking albums. Why Hasn’t Everything Already Disappeared? is a sonic expansion of the warm tones found in Deerhunter’s 2015 Fading Frontier. Immediately recognizable as a great Deerhunter album but more relaxed, still psychedelic but less far-out than they once were. Pleasant songs to hum along, with a tendency to spin and less nice lyrics. Surging into new ground while retaining elements of their classic sound. Why Hasn’t Everything Already Disappeared? is an extension of the ideas Cox was flirting with on the band’s 2015 album, Fading Frontier, only this time he’s replacing guitars with harpsichords to execute a grand detournement from the rock'n'roll genre. Like most Deerhunter albums, this one contains a sense of foreboding and existential crisis, but it’s hidden within cheerful melodies and kaleidoscopic, candy-colored arrangements that often include horns and harpsichords among the guitars and synthesizers. A powerful, graceful guitar and ghost album about disappearing. Deerhunter offer a 21st-century state-of-the-world address in surrealist pop form. Those who exercise patience will hear a record that sounds particularly characteristic and - in a somewhat inconsistent way - describes what it is like to live in our fast-paced and disorienting society. The band succeeds once again in making a completely unique record in an already richly filled discography. You get the feeling you’ve been thrust into a dream, temporarily torn from the present in order to observe it, understand what’s going on, and return to reality with new tools to keep that all-encompassing fear at bay. A rechristening for the band, a more formidable statement from a band whose songwriting is as resilient as ever. This is a new side of Deerhunter that gives the listener much to contemplate. These songs contend with the emotional and physical ramifications of life in a country that’s reiterating itself to death, one franchise reboot or startup reinvention at a time. After eight albums, Deerhunter continues to push its sonic storytelling into uncharted territory. Why Hasn’t Everything Already Disappeared? is another crisp, clean, reserved collection that defies instant gratification but rewards careful attention. Though the album loses some of the momentum from its gripping beginning, the twisted imagery lingers long after the final notes. Why Hasn’t Everything Already Disappeared?, sweeps away any remaining traces of autobiographical writing and directs its focus towards humanity’s current predicament—all through a spacey sound and science-fiction-like lyrical bent. On Why Hasn’t Everything Already Disappeared? they go pastoral, delivering an album that sounds like windswept grains, like dust floating off a side road. Even depressing themes (nationalistic violence in "No One's Sleeping", death in "What Happens To People?") Seem to be so overwhelming embedded in this flawless chamber pop. Why has not everything disappeared? Why is Deerhunter not a much larger group? As Cox sings on ‘Futurism’: “Your cage is what you make it / If you decorate it / It goes by faster.” I for one am happy to wait out my days, whatever’s left of them, listening to Deerhunter. The theme is handled so timidly that it’s easy to start questioning whether it’s there at all. ‘Why Hasn’t Everything Already Disappeared?’ is the first full-length of its generation to confront the escapism vs. engagement debate by planting its flag firmly in the middle. They continue to look forward and create music that feels unlike anything else out there. The slow, crumbling decline of civilisation has rarely sounded so good. It should come as no surprise that Disappeared is their most complex work since Halcyon Digest and features a theme that others have tried with more directness. Why Hasn't Everything Already Disappeared? wrestles with escapist and confrontational impulses, and continues the band's exploration of shifting sonic identity. Deerhunter have often dealt in lofty, intense blows, but on album eight, they provide a breezy distraction from the chaos outside, and it’s most welcome. I’ll probably never tire of hearing Cryptograms and can’t imagine not regarding Monomania as the band’s apex; Fading Frontier and Why Hasn’t Everything Already Disappeared? are significant albums, however, stylistic milestones for Deerhunter as well as fertile additions to rock’s ever-broadening landscape. It’s utterly, completely, resolutely and defiantly them. It’s futuristic but warm, nostalgic but distant, pretentious but human. It’s a mess of contradictions, a jumble of cohesive ideas – and a reminder, if one were needed, what a great feeling it is to be part of a “small audience”. This atmospheric album switches from psych-pop to alt-rock to experimental lo-fi, held together by Bradford Cox’s drawl. It is unpredictable and compelling – classic Deerhunter. Perhaps most important for those who have followed Deerhunter from the beginning, there’s plenty to suggest that the group’s creative energy will sustain it into middle age. Despite the grim reality WHEAD draws attention to, songs like “No One’s Sleeping” show that sonically, the album is an exuberant and tightly knit pop record. ‘What Happens To People’ and the instrumental ‘Greenpoint Gothic’ throw back to the ambient synth textures of earlier albums, but otherwise the sounds of harpsichord wires twisting and drum kits dissolving are spun into arch pop seemingly in homage to The Beatles or glam-era Bowie. It may do, it may not – but half of the fun of this album lies in attempting to figure it out. It’s in the almost hidden contrasts of these songs that Deerhunter hits on a powerful formula for songcraft.